On first bounce, when we look at the 2013 Open Doors enrolment data for international students studying in the US, one fact leaps out: China is sending huge numbers of students to US higher education institutions, and these students are a significant driver of the 7.2% growth the US experienced in international student enrolments this academic year. A whopping 235,597 Chinese students studied in the country in 2012/13, an increase of 21.4% year-over-year. America may be unduly – even riskily – dependent on Chinese students, as enrolments from China jump far ahead of the pack of other leading sending nations (the #2 and #3 sending countries, India and South Korea, sent fewer students than the year before: 3.5% fewer and 2.3% fewer, respectively). Both conclusions are probably true, but not in any immutable way. 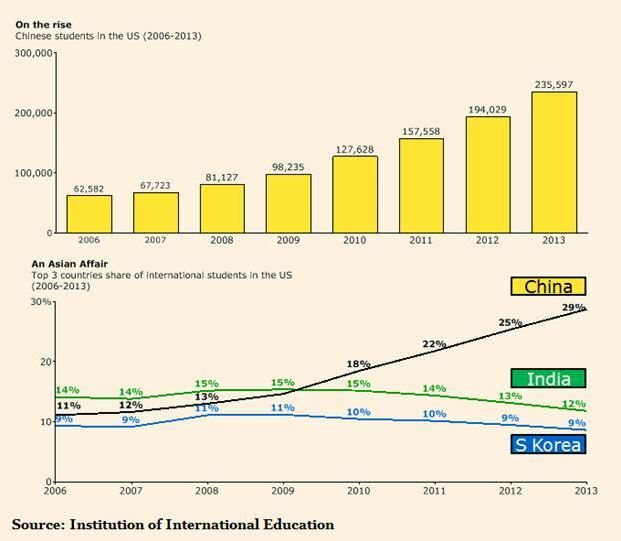 The major Chinese share of the American international student population is a very recent phenomenon, as the following graphic published in the Financial Times demonstrates (the source for the graphic is the US-based Institute of International Education (IIE), the organisation behind Open Doors). China may be leaping ahead in its trend of sending international students, but the declines registered by India and South Korea in 2012/13 (again, of -3.5% and -2.3%, respectively) – are relatively small. Moreover, new data from the Council of Graduate Schools (CGS) finds that the number of first-time graduate students from India increased 40% this year, much more than the 1% increase in 2012 and 2% increase in 2011. The CGS finding of increased Indian graduate student numbers is noteworthy despite the challenges that many Indian students have faced this year with the slide of their rupee, which has made study abroad much less affordable. On top of Indian students’ contribution to American graduate enrolments, many other countries are responsible for the (total) enrolment growth in the US. For example, Kuwait sent 37.4% more students in 2012/13 than in 2011/12, Saudi Arabia sent 30.5% more (and jumped into 4th place as a sending nation), Brazil 20.4% more, and Iran 25.2% more. Less dramatically but still important, Canada, Colombia, France, Germany, Indonesia, Iran, Malaysia, Mexico, Nigeria, Saudi Arabia, Spain, UK, and Vietnam all sent more students than they did in 2011/12. In fact, all of the top 25 sending nations to US education institutions sent more than 5,000 students in 2012/13. As much as the Chinese market may seem like the easiest way for US institutions to achieve their international student enrolment targets now, the data referenced above suggests that an approach that emphasises diversification across multiple markets is – in the long term – a better bet. For starters, the foundation is there. America has long been the top choice for a majority of sending markets, and it continues to attract students from dozens of different countries. Many of the declines registered this year from certain sending countries (e.g., India and South Korea) are slight – slight enough that they could well be offset with focused recruiting in the years ahead. Second, emerging markets other than China are showing their interest in a long-term educational relationship with the US: Brazil and Saudi Arabia in particular, via their generous government sponsorship programmes. These programmes are producing large numbers of new students today but historically such large-scale scholarship or exchange programmes have often played an important role in establishing student mobility patterns with major destination countries for the long term. Third, institutions that truly want to internationalise their campus need to ensure a healthy variety of countries are represented. Domestic students (and professors) will appreciate the opportunity to interact with young people from all corners of the globe, and more diversity on campus also gives incoming international students greater chances to mix and mingle with more nationalities. Fourth, the prospects for continued Chinese investment in US education are probably solid for the foreseeable future, but questions remain for the long term. China is investing heavily in its higher education system, and is steadily adding more and more universities to world-class rankings. It may soon have more top-quality, prestigious educational options for its students within its own borders. The question will be whether China can expand the capacity and quality of its domestic system to the extent that a greater share of Chinese students will be encouraged to pursue their studies at home. Moreover, most Chinese students going to the US are self/family-funded, so their continued applications to the US depend on the continued expansion of the middle class. The Open Doors data show not only a heavy US reliance on Chinese international students, but also a wealth of other opportunities. The latter are smaller in comparison but – as in any global investment portfolio – a diversification strategy beats all eggs in one basket every time. This entry was posted in Agents, Asia, Europe, Higher Education, Middle East, North America, Regions, Research, South & Central America, United States and tagged youth trends, student recruitment agencies, tertiary education overseas, Indonesia, student mobility.